Happy soon to be St. Patrick’s Day! Let’s celebrate with some yumminess. In the past I’ve done green food like these pancakes, and these muffins, and vegan Irish cream. This year we’re focusing on the potato. Oh how I love a potato. I’m going to play up the awesomeness of the Yukon Gold potato in this variation of Colcannon, or mashed potatoes with green stuff if you aren’t Irish. 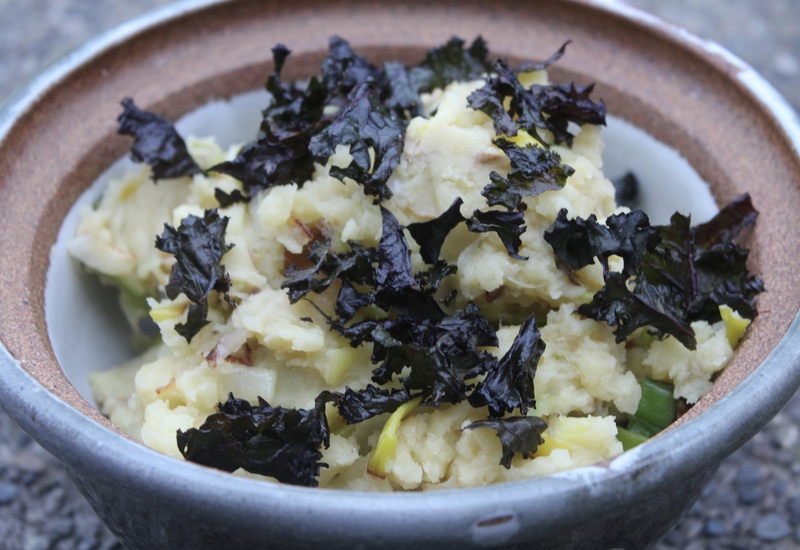 Traditionally Colcannon is as Irish dish made from mashed potatoes with kale or cabbage folded in. It is often perked up with scallions or leeks. For this vegan variation I am sautéing leeks and folding them in, and garnishing with kale chips. It’s pretty, yummy, and my girls love to pick the kale chips off the top. Honestly, that’s the only part they eat. I think I have the only kids in the world who won’t eat mashed potatoes. Kale chips are a huge hit in our house, but they shatter and always leave tiny little pieces at the bottom of the container. This is a perfect way to use them up. And a perfect excuse to try making kale chips if you haven’t yet. The twist in this recipe is adding the salt and vinegar to the cooking water for the potatoes. When you do this the potatoes are flavored from the inside out and each and every bite becomes a perfectly seasoned flavor bomb. Place potatoes in a 3qt pot and cover with cold water to 1″ above the potatoes. Add salt and vinegar to the pot and bring to a boil. Continue boiling until potatoes are tender, 10-12 min. While potatoes are cooking heat a large skillet over medium heat. Once hot add olive oil and swirl to coat the bottom of the pan. Add leeks and sauté until leeks are tender, about 7 minutes. Remove from heat if potatoes are not yet cooked. Once potatoes are cooked drain them and return to the cooking pot. Add butter, milk, and nutritional yeast and mash to your desired consistency. Fold in cooked leeks, taste and adjust seasoning. Garnish with kale chips and serve immediately.